New Delhi: The JNU has ordered removal of a controversial poster which sprang up on its campus demanding "freedom for Kashmir and Palestine". The poster with "Freedom for Kashmir! Free Palestine! Right to Self Determination Long Live! DSU" written on it was spotted on a wall by some students who alerted the university authorities. "We don't know who put up the poster... the administration has asked the staff to bring it down," a senior university official said. Stressing that a small group of people are trying "vitiate the academic environment", the official said, "the university has already lost precious time and energy in such unnecessary controversies." 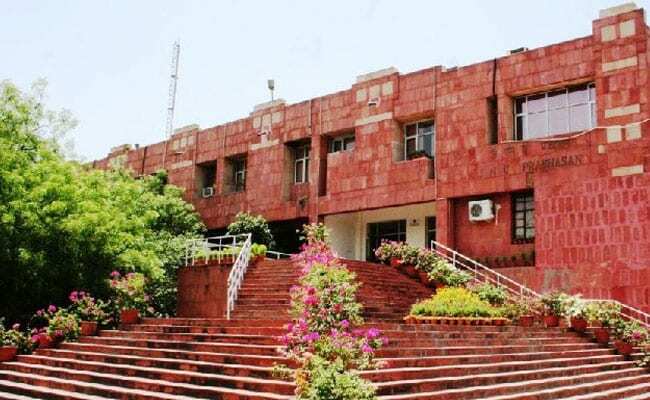 Three JNU students, then member of Democratic Students' Union (DSU) Kanhaiya Kumar, Umar Khalid and Anirban Bahttacharya - were arrested in February last year on sedition charges in connection with an event on the campus where anti-national slogans were allegedly raised. Umar Khalid, Mr Bhattacharya and former student union president Kanhaiya Kumar are out on bail. Last week, the BJP-linked student body ABVP had objected to an invitation to JNU student Umar Khalid to speak at a seminar at Delhi University's Ramjas College. While the college administration withdrew the invitation following opposition by the ABVP, it led widespread violence after clashes between the ABVP and the Left-affiliated All India Students' Association (AISA). The ABVP members on Thursday staged a protest outside Delhi Police headquarters demanding that a charge sheet be filed in last year's sedition case against three JNU students including Umar Khalid and Kanhaiya Kumar.